Every year, LabexMER provides grants for incoming and outgoing mobility of master students and PhDs. It promotes interactions between students and world class experts with summer schools (IS), international workshops (IW) and short courses (SC). Combining experimental and Dynamic Energy Budget (DEB) modeling approaches to better understand the impact of stressors on marine organisms: which scales, which methods? Dynamic energy budget models have been mainly applied to address the individual responses to food, temperature and toxicants effects. With the increasing amount of information and experimental data on responses measured at the scale of genes, cells and individuals, there is a need to improve and extend DEB formulations. 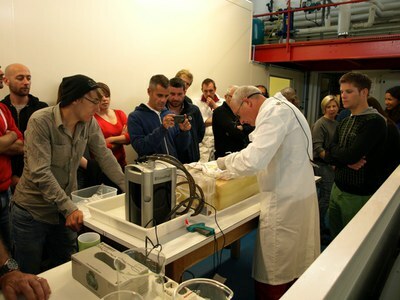 2 days courses on technologies relateded to wind farm, hydrokinetic turbine and tidal energy. 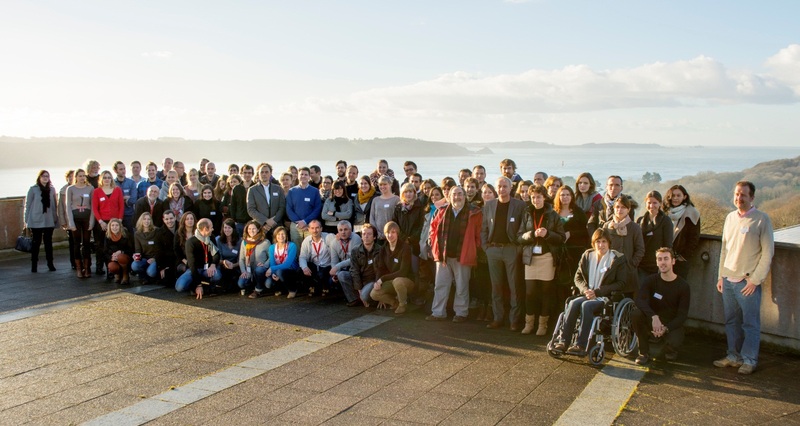 ACO 2016 (IW)"a connected ocean"
Challenges for future ocean knowledge and data integration through five sessions and a workshop co-organized with EuroGOOS. The 3rd MarCoPol Forum is intented toprovide policy-makers, policy-influencers, practitioners, regulators, and researchers the opportunity to discuss approaches and challenges in the implementation of European marine and coastal policies in various member states. Forum is organized around a broad range of topics on marine and costal policy, and will enable stakeholders to discuss management and conservation issues, as well as potential solutions for coordinated action. The aim of the workshop is to gather international experts in the field of deep sea microbiology, and give them the opportunity to present very recent data, and to discuss future cooperative works, in a friendly atmosphere. Attendance and lectures are on invitation only, but the meeting is open for audience to PhD students and post-docs working at the hosting institute. This will give young scientists opportunity to listen to up to date talks, meet and discuss with experts during the breaks. It remains a central problem to relate how marine fishes perform in laboratory experiments with knowledge of the habitats they choose to occupy and the conditions they experience in their natural environment. There are immense technical difficulties in following the movements of fish in the vast underwater realm, let alone in estimating how this relates to their physiological state, and whether they choose habitats that optimise their fitness. 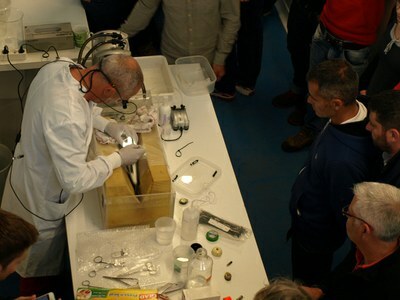 The aim of this workshop is to provide early and mid career fish physiologists and ecologists who have little or no experience of telemetry a comprehensive view of the different technologies available and their past, current and potential applications in a marine fish context. 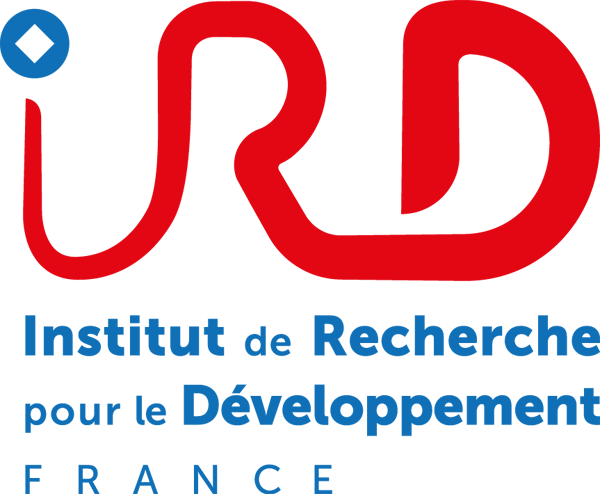 Presentations and demonstrations will be given by internationally renowned experts and from leading device and system manufacturers. It is intended that participants should see how telemetry can enhance their research and, through dedicated hands-on training using acoustic, archival, and satellite telemetry systems, provide them with the knowledge and skills needed to start using telemetry to develop their research as it relates to marine fish ecology and conservation. The overarching objective of this inter-disciplinary and international workshop was to bring together Arctic scientists of both different areas of expertise and experience level in order to discuss future research priorities for the Arctic Ocean from an early career researchers’ perspective. In addition, master students from IUEM joined the sessions in the framework of their English curriculum. The natural variability in the Arctic marine system was reviewed over various spatial and temporal scales in order to better understand the changing Arctic marine system. During plenary lectures, invited speakers provided overviews of their respective research topics. During parallel sessions, participants presented newest results of their ongoing research, which fed the comprehensive discussions on future Arctic research priorities during the second half of the workshop. Results from the workshop show that keys to better predictions of the future state of the Arctic system are: improving (i) the taxonomic knowledge of the Arctic Ocean’s biodiversity, (ii) the calibration of climate proxy indicators to modern ocean and sea-ice conditions (iii) the understanding of snow and sea ice thickness variability, (iv) of coastal erosion and (v) biogeochemical cycles. These results are summarized into “Priority Sheets” that will be presented at the 3rd International Conference on Arctic Research Planning (ICARP III) in Japan in April 2015. The extraction of knowledge on ocean’s dynamic at small and large scales as well as the development of regional and global indicators of climate variability are hot topics, for which new technological and methodological challenges recently emerged. Database have grown bigger and bigger (from the giga to the peta-scale) with rapid updating frequencies (from the year/month to the day/hour scale), and involve complex structures and higher dimensionality (from one file/parameter to millions of files and dozens of parameters on multiple locations). To the physical oceanographic community it has become challenging to manage, explore and extract knowledge out of such databases. “Data Mining”, “Database Knowledge Discovery” or “Artificial Intelligence” are the names given to the research discipline dedicated to face such challenges. 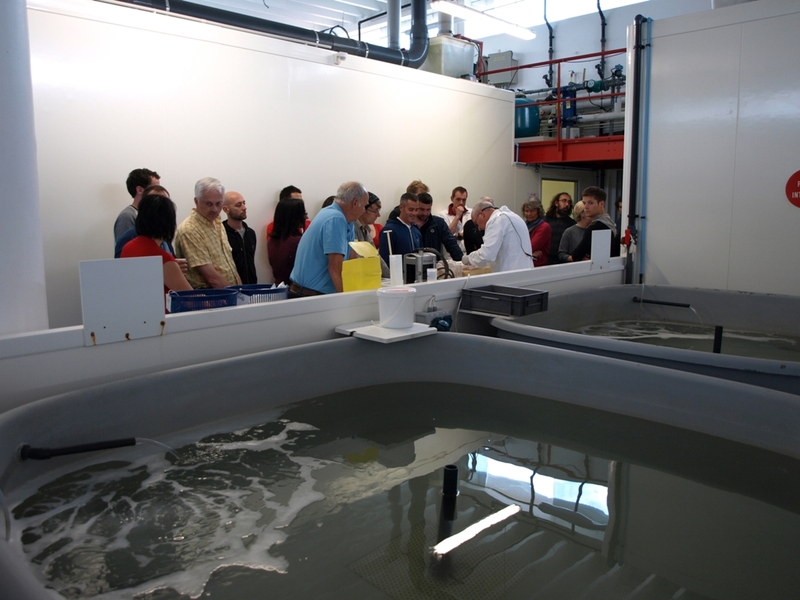 The school aimed at fostering interactions between the “Data Mining” and “Oceanographic” research communities and for the latter to broaden its view on available analysis tools. the oceanographic community who wished to broaden their analysis skills of oceanic databases (such as from Argo, Cersat and SSALTO/DUACS). They should preferably be engaged in ocean physics studies, but work in a neighboring field such as atmospheric physics/meteorology and bio- or geo-sciences may also be considered. the data mining community seeking for new case studies and applications in the domain of environmental sciences. 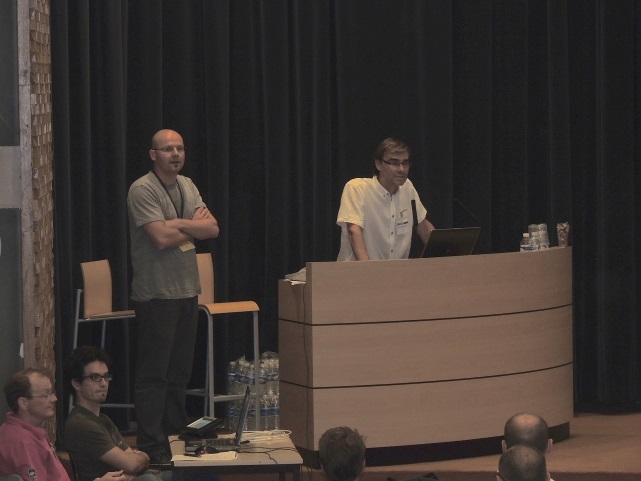 OBIDAM'14 consisted of a series of invited talks covering both theoretical and practical aspects of data mining tools and methods, including applications to environmental science. 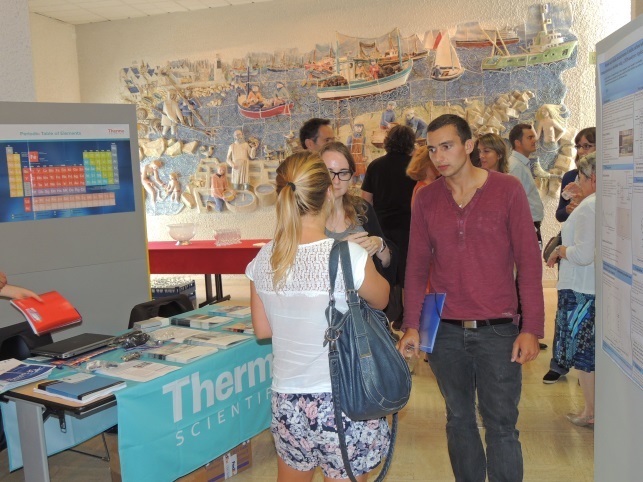 It also provided the opportunity to participants to present and discuss their research work during a dedicated poster session. Final presentations (english) and report (french) are available online, from the left main menu or the right panel shortcuts. Thanks to all the participants and speakers ! Almost all aspects of daily life involve plastics, and consequently the production of plastics has increased substantially the last 60 years. Plastics are persistent materials, which tend to accumulate in the marine environment and affect marine life as they remain there for years. The microplastic (MP) are generally defined as all plastic particles less than 1 mm and can have several origins / sources. Primary MPs are included in industrial abrasives, exfoliants, cosmetics, and pre-production plastic beads the latter being one of the main components of marine debris. Secondary MPs are products of degradation (mechanical forces and / or photochemical processes) plastic debris. Another important part of the secondary MPs comes from synthetic fibers produced during our laundry. Those particles also contain additives such as UV-stabilizers, colourings, flame retardants and plasticizers, which are transported by the particles and are susceptible for uptake and accumulation by living organisms. These microplastic can adsorb persistent organic pollutants (POPs) and facilitate their transfer in marine food webs. These POPs can be several orders of magnitude more concentrated in MPs as compared to the surrounding water. Although the absorption of MPs from different marine organisms began to be reported in the literature about the biological effects of MP are still very limited. 1) Increase awareness of researchers, students and general public to the fundamental role of meiofauna in marine ecosystems from the coastal zone to abyssal depths. 2) Train students and researchers to the identification and description of meiofauna through several complementary disciplines (taxonomy, ecology, molecular biology) and stimulate a new generation of meiobenthologists. 120 participants from 26 countries 20 grants for support students and researchers to attend the meeting (10.000 €) 46 contributions (9 plenary talk, 16 oral presentations, 21 posters) 6 thematic sessions.